This work presents a new indexing data structure for query processing, called the Bin-Hash index that effectively utilizes the parallel processing power of the Graphics Processing Unit (GPU). Our approach concentrates on reducing both the amount of bandwidth and memory required to evaluate a query. We achieve this goal by integrating two key strategies: we use encoded data tables to help overcome the limitations imposed by limited GPU memory, and a technique known as perfect spatial hashing to accelerate the retrieval of raw data necessary for candidate checks. We support our candidate checks with a flexible dual cache (one for the GPU and one for the CPU) that uses independent replacement polices. To this end, the CPU serves as a host to the GPU, only supplying the raw data needed for candidate checks; all query evaluations are performed on the GPU by executing kernels written in NVIDIA�s data-parallel programming language CUDA. In our timing measurements, our new query processing method can be an order of magnitude faster than current state-of-the-art indexing technologies such as the compressed bitmap index. This movie demonstrates the Bin-Hash index�s ability to perform query-driven visualization tasks at an accelerated rate. 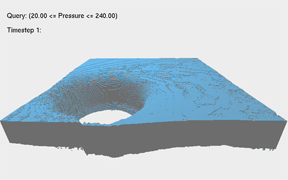 In this example we query a Hurricane simulation dataset for a constant range of pressure: (20.0 ≤ pressure ≤ 200.0). In total we analyze and render the results from 46 time steps where each time step consists of a distribution of 22M cells in a uniform hexahedral grid: 500 x 500 x 90. In all a total of 1 billion cells are queried and visualized in less than 6 seconds. We present a new approach that enables query-driven analysis and multitemporal visualization of time-varying AMR data. Previously, such analysis and visualization efforts were hindered by the dynamic temporal and spatial properties of AMR grid hierarchies. We present a two-step method for compositing and synchronizing AMR data from a series of time steps. We first generate a composite template from the AMR grid hierarchies of these time steps; the composite template preserves the finest level of grid cell refinement from each grid hierarchy. We then synchronize each time steps grid hierarchy to the composite template. This approach enables our method to process queries on a common AMR grid hierarchy. Using this data structure, we move the work of query processing to the GPU to realize the benefit of greatly accelerated QDV analysis. On the GPU side, we integrate our new method with a GPU-based query engine, called the Bin-Hash index. Select grid hierarchies before the generation of the composite template and synchronization steps. Query-driven visualization of a hurricane data set displayed in temporally sequential form. Green regions correspond to areas of high cell refinement, gray regions indicate areas of very low cell refinement. Each time step consists of five levels of refinement and 8.6 million cells. Select grid hierarchies after the generation of the composite template and synchronization steps. Query-driven visualization of a hurricane data set displayed in temporally sequential form. Green regions correspond to areas of high cell refinement, gray regions indicate areas of very low cell refinement. Each time step consists of five levels of refinement and 8.6 million cells.